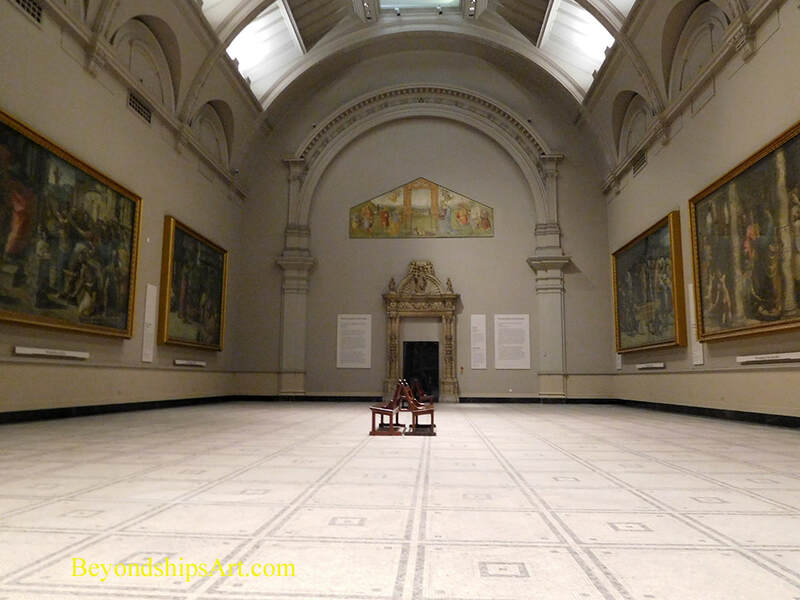 The Victoria and Albert Museum in London is one of the world's great museums. It holds many of the United Kingdom's national collections and houses some of the greatest resources for the study of architecture, furniture, fashion, textiles, photography, sculpture, painting, jewelry, glass, ceramics, book arts, Asian art and design, theater and performance. Although it began as a museum of design and applied arts, its fine art holdings are world class. In addition, to its permanent collection, the V&A hosts temporary exhibitions. The V&A traces its history back to the Great Exhibition of 1851. Championed by Queen Victoria's consort Prince Albert, that exhibition was held in the Crystal Palace, a temporary building erected in Hyde Park, and showcased the best in modern design and manufacturing. It was tremendously successful and civil servant Sir Henry Cole suggested to Prince Albert that there should be a permanent museum that would act as a “schoolroom” for teaching business and the public about design. The Prince agreed and using some of the profits from the Great Exhibition, the Museum of Manufacture was established in 1852. Quickly outgrowing its quarters in Marlborough House, the Museum of Manufacture moved to a parcel of land near the south side of Hyde Park in 1854. This parcel also had been purchased with profits from the Great Exhibition and is near a number of museums and landmarks with a connection to Prince Albert including the Albert Memorial and the Royal Albert Hall. The museum now came to be known as the South Kensington Museum. Over the next half century, a series of buildings were erected on the site to house the museum's growing collections. Finally, in the closing years of the century architect Aston Webb was commissioned to design a building that would unify the various buildings on the parcel. In her last public ceremony, Queen Victoria laid the cornerstone for the new building in 1899. The name of the museum was then changed to the Victoria and Albert Museum. During the second half of the 19th century as a result of gifts and loans, the museum assembled a wide array of collections. As a result, the V&A's holdings became quite diverse. (Indeed, the neighboring Science Museum grew out of the V&A's collections). The V&A's collection today includes some 6.5 million items drawn from Europe, North America,.Asia and Africa, spanning 5,000 year of human creativity. The collection includes glass, ceramics, textiles, costumes, musical instruments, silver, ironwork, jewelry, furniture, medieval objects, sculpture, prints, drawings and photographs Its buildings cover 12.5 acres and have 145 galleries. Still, only a fraction of the permanent collection can be displayed at one time. Among its most notable holdings relating to fine art are the Raphael cartoons. These are a series of large paintings done by the Italian Renaissance master Raphael as designs for tapestries for the Sistine Chapel. The V&A has one of the largest collection of post-classical sculpture in the world. Its holdings of Italian sculpture are particularly noted. The V&A also has 20 bronzes by Rodin. In addition, the V&A has a collection of 18th and 19th century British painting including works by Constable, Gainsborough, Reynolds and Turner. There are also paintings by other European artists including Botticelli, Rembrandt, Van Dyck, Tintoretto and Degas. Because the museum encompasses a number of buildings, it is somewhat difficult to navigate. However, the buildings are works of art in themselves with interesting Victorian decoration. 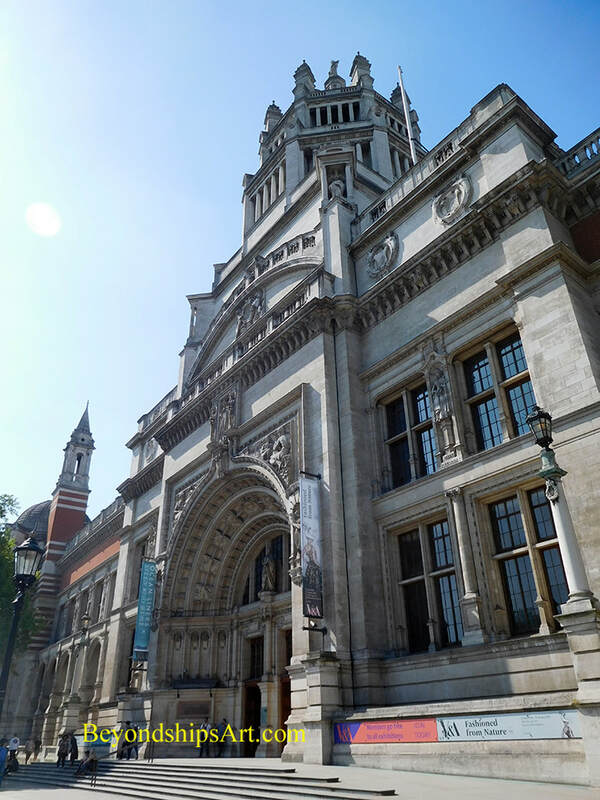 In 2001, the V&A embarked on a major renovation program seeking to restore the buildings while at the same time modernizing the visitor experience. For information on visiting, see the V&A's website. Above: The Raphael Cartoons are displayed in a vast gallery.